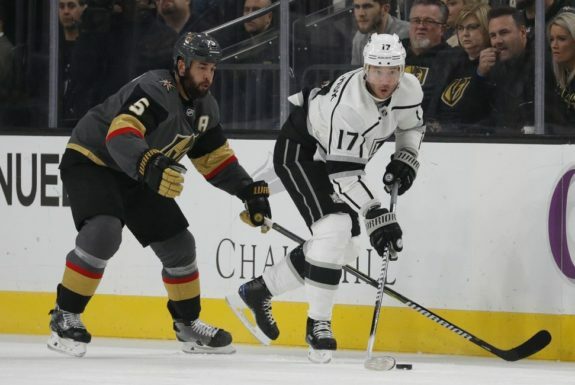 LAS VEGAS — Marc-Andre Fleury stopped 17 shots for his league-leading sixth shutout and the Vegas Golden Knights beat the Los Angeles Kings 2-0 on Tuesday night. Brandon Pirri continued his amazing scoring run for the Golden Knights in the third period, when he jumped on a loose puck at the right faceoff dot and sniped his sixth goal and eighth point in seven games this season. Pirri has nine goals in nine games since joining Vegas last season. Fleury, who improved to 7-0-3 in his last 10 appearances dating to Dec. 9, got his 23rd win in his 37th start — both league-bests. Alex Tuch added an empty-netter in the final minute for the final margin. During the four-game streak, Fleury and Malcolm Subban have stopped 106 of 109 shots (97.2 save percentage) while the team has allowed just two power-play goals in 14 opportunities (85.7 per cent). Los Angeles goalie Jack Campbell, who was reactivated on Monday, had a career-high 46 saves, including several spectacular stops in the second period when the Golden Knights had 18 shots. While it’s normally Fleury who is diving between the pipes making flashy saves, Campbell’s biggest save came during a Golden Knights power play. Vegas’ Jonathan Marchessault fired a one-timer at a wide open net, but Campbell came flying from the right post to the left to block the shot and keep the game scoreless. The Kings are 5-2-1 in their last eight games. NOTES: Vegas F Cody Eakin is one game shy of his 500th, while F Jonathan Marchessault in one away from 300. … Kings D Drew Doughty has played in 369 consecutive games, dating to Oct. 8, 2014. … Campbell’s first NHL win was inside T-Mobile, where he made 41 saves in a 4-1 win over the Golden Knights last February. … Kings F Anze Kopitar, who has recorded points in eight of the last 11 games (2 goals, 7 assists) had his four-game point streak snapped. He is one goal shy of 300 in his career.